Meet one of our favorite people and volunteer; Del Owens of Denver, CO. Anyone who’s been around our camps for more than a couple of hours has certainly seen Del. Many people will give in to the phrase “I’m too old” for that. However, Del’s 84-year young spirit will not keep him from being involved. He loves our programs, but more importantly he loves the members. He is a great friend of ours and so was his beloved wife Dinah, who left us too soon. 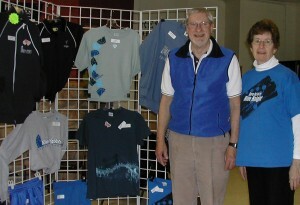 They supported our Blue Knights Drum and Bugle Corps and our Blue Knights Percussion Ensemble for decades. It is inspiring that “they” continue to believe in, and support, our members. A “Dinah Owens Memorial Scholarship” fund helps several members with a significant portion of their fees each year. See the Colorado Gives Day details below on how you can help make that possible for yet another year. 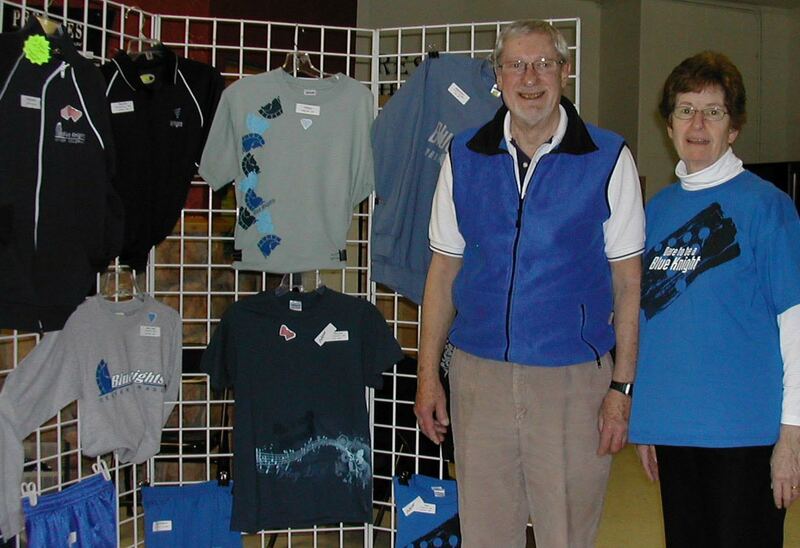 A blast from the past – Del and Dinah enjoying their time as the Merchandise Team. These chance events led to more than 20 years of involvement with Ascend’s programs. First, as a donor – through the retail stores he and Dinah owned they found satisfaction providing financial gifts when they could. Del then found his way into a multitude of volunteer roles. The list is long and continues to grow. From making corps camp airport shuttle runs; preparing, maintaining and driving props to percussion ensemble events; working registration and food service at camps; shako fitting and maintenance; merchandise preparation and sales with Dinah (the Merchandise Coordinator); and serving on the Booster Board and DATR committee and on the Friendship Cup Marching Band Competition staff. Del finds it very rewarding to be associated with Ascend Performing Arts and the musical education it provides. He’s “been grateful for every opportunity to support an organization involved in youth education”. Del himself was a snare, bass, and tympani percussionist from high school through the United States Air Force and even played tympani professionally. Volunteers don’t need a music background to be involved. Anyone can. To someone who may be considering filling a volunteer spot, Del says, “Just do it. You won’t be disappointed. The feeling of accomplishment together with the family atmosphere of the Blue Knights will result in an unforgettable experience.” Not to mention doing it for the sound of the “kids saying ‘Thank You!'”. To that end, we would love to help anyone find their volunteer home with us! Don’t be shy. Give it a try, click here! On Behalf of Ascend Performing Arts and the Blue Knights – Thank you Del! Much love to you and continued warm thoughts of Dinah! The loving eyes of a loving woman. 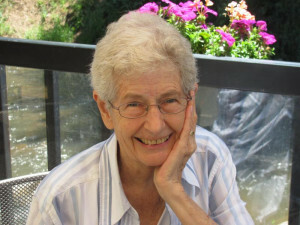 Your donation to the Dinah Owens Memorial Scholarship, or one of our other programs, will share the love for years to come. Your contribution will help several deserving performers who are selected through a scholarship application process. ∴ Come meet others like him! We would love for you to volunteer with us and, if you want one, we can help you find your niche with us. Visit our Volunteer web page at https://ascendperformingarts.org/support/volunteer/ and send us an email to connect. Make our youth your extended family! Volunteer Spotlight by Keith Huffman, Volunteer Coordinator.